The Journal of Law and the Biosciences Is Launched! The Journal of Law and Biosciences is a peer-reviewed, faculty-edited journal published by Oxford University Press. It will publish three issues a year (in March, July, and November), on-line, on all areas of the intersection of law and the biosciences, from patent law and FDA regulation to cognitive enhancement and genetic selection, with many stops between. The Journal is owned by Duke University, Harvard Law School, and Stanford University. Its founding three co-editors-in-chief are Nita Farahany at Duke, I. Glenn Cohen at Harvard, and me. We're looking for a few good papers of up to 10,000 words. The Journal will also have a student-written "developments" section. The Journal is now accepting submissions; here's the link. 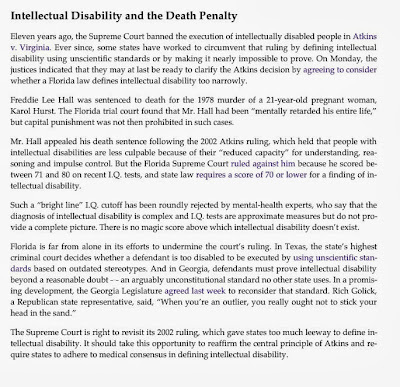 The Hall v Florida Atkins case, which will be reviewed by SCOTUS, has been generating considerable buzz the past few days, including an editorial in the NY Times (Intellectual Disability and the Death Penalty - 10-22-13; image of editorial below--click to enlarge to read). This is a very important case given Florida's complete disregard for the scientific facts that underlie the psychometrics of intelligence tests--in favor of a "bright line" criteria that fails to account for the standard error of measurement (SEM) in IQ scores. I have previously made a couple of posts re this problem in Florida. These posts can be found here. Together with Kevin Foley, I published an IAP Psychometrics 101 Report (#11) which addresses the issue of the SEM in Atkins cases. I hope that SCOTUS will recognize the obvious scientific flaws in the Florida Atkins criteria. Click on image to enlarge for reading. This is from "The Cattell-Horn-Carroll Theory of Intelligence" chapter (warning...thus is large 20MB file)in Flanagan and Harrison's 3rd edition of Contemporary Intellectual Assessment. 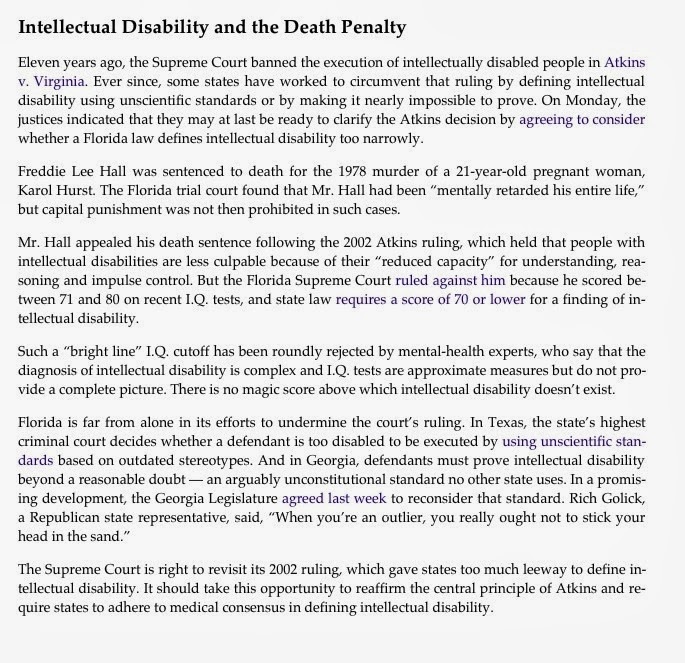 The state that was the first to pass a law prohibiting the execution of mentally disabled death row inmates is revisiting a requirement for defendants to prove the disability beyond a reasonable doubt — the strictest burden of proof in the nation. l's lawyers have long maintained he is mentally disabled and therefore shouldn't be executed. The state has consistently argued that his lawyers have failed to prove his mental disability beyond a reasonable doubt. Hill has come within hours of execution on several occasions, most recently in July. Each time, a court has stepped in at the last minute and granted a delay based on challenges raised by his lawyers. Only one of those challenges was related to his mental abilities, and it was later dismissed. A coalition of groups that advocate for people with developmental disabilities pushed for the upcoming legislative committee meeting and has been working to get Georgia's standard of proof changed to a preponderance of the evidence rather than proof beyond a reasonable doubt. Hill's case has drawn national attention and has shone a spotlight on Georgia's tough standard, they say. The process has taken an enormous amount of education, said Kathy Keeley, executive director of All About Developmental Disabilities. Rather than opposition to or support for the measure she's pushing, she's mostly encountered a lack of awareness about what the state's law says, she said. The groups are hoping to not only express their views at the meeting, but also to hear from others to get a broader perspective, Keeley said. The changes should be relatively simple and very narrow in scope, targeting only the burden of proof for death penalty defendants, she said. Ashley Wright, district attorney for the Augusta district and president of the state District Attorneys' Association, said prosecutors question the logic of changing a law that they don't see as problematic and that has repeatedly been upheld by state and federal courts. "The district attorneys don't believe that you change a law for no reason and, in this case, the law appears to be working," she said. "Where has a jury done a disservice? Why are we putting all our eggs in the defendant's basket and forgetting that there's a victim?" Prosecutors agree that the mentally disabled shouldn't be executed, and defendants are frequently spared the death penalty when there is proof of their mental disability supported by appropriate documentation from credible and reliable experts, she said. But Hill's lawyer, Brian Kammer, argues that psychiatric diagnoses are complex, and "experts who have to make diagnoses do not do so beyond a reasonable doubt, they do it to a reasonable scientific certainty." Furthermore, he said, disagreements between experts make the beyond-a-reasonable-doubt standard nearly impossible to meet.... In Hill's case, a state court judge concluded the defendant was probably mentally disabled. In any other state, that would have spared him the death penalty, Kammer said. "The Federal Death Penalty and the Constitutionality of Capital Punishment"
The federal death penalty results in few executions but is central to the larger story of capital punishment in the United States. In the last decade, federal statutes governing the federal death penalty seem to have exerted outsize influence with the Supreme Court in its development of "proportionality" doctrine, the rules by which the Justices confine the use of capital punishment under the Eighth Amendment. In three cases rejecting capital punishment for mentally retarded offenders, juvenile offenders and child rapists, the Court noted that federal death-penalty statutes would have conferred protection against federal death prosecutions. These decisions, and current federal death-penalty law, suggest that the Court could resolve certain nuanced proportionality problems by restricting the death penalty in the states. However, for observers who hope to see the Court eventually use proportionality analysis to abolish the death penalty or greatly restrict its use, these developments seem to carry mostly negative implications. The relatively broad application of federal death-penalty law would weigh against sweeping proportionality restrictions on the death penalty for murder. However, the article explains why the Court's proportionality analysis fails adequately to consider low execution rates and why the rarity of federal executions, if persistent, should undermine any notion that federal death-penalty law and practice supports a national consensus favoring capital punishment for ordinary murder. On the opening day of the U.S. Supreme Court's new term, the Justices announced they would not review the case of Warren Hill, a death row inmate in Georgia with multiple findings of intellectual disability. Hill petitioned the Court after three mental health experts, who initially said he was not mentally disabled, changed their assessment. The execution of inmates with mental retardation was ruled unconstitutional in 2002, but Georgia has the strictest standard in the nation for proving this mental disability--proof beyond a reasonable doubt. Brian Kammer, a lawyer for Hill, said, "Mr. Hill has been procedurally barred from proving his exemption from capital punishment, which is why he brought his case to the U.S. Supreme Court, in the hopes that the court would ensure that the evidence of his intellectual disability would be heard. It is tragic that our highest court has failed to enforce its own command that persons with mental retardation are categorically ineligible for the death penalty." Hill maintained he has met Georgia's exacting standard because all mental health experts who have tested him concur in his disability. Georgia could change its standard for proving retardation, bringing it in line with the standards in other states. Hill's execution remains on hold because of a pending review of the state's lethal injection law. 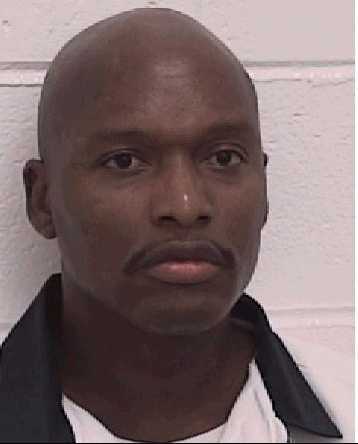 (K. Brumback, "High court won't take case of Ga. death row inmate," Associated Press, October 7, 2013). See Intellectual Disability and U.S. Supreme Court. Over 30 speak­ers and 170 reg­is­tered par­tic­i­pants dis­cussed the lat­est on brain research, health and inno­va­tion at the fourth annual SharpBrains Virtual Sum­mit, held in Sep­tem­ber 2013. Here are some of the fas­ci­nat­ing high­lights that can help iden­tify emerg­ing oppor­tu­ni­ties and pre­pare for sig­nif­i­cant changes likely to occur in the next 3-5 years. Which of those high­lights seem more sur­pris­ing or rel­e­vant to you? Impor­tant Note: All 15 Sharp­Brains Sum­mit ses­sions were recorded, and 15+ hours of record­ings are avail­able now. --> Learn Here How to Access the Recordings, so you can under­stand those 30 high­lights in more depth, and dis­cover many more. Reg­is­tered Sum­mit par­tic­i­pants can use same login and pass­word used dur­ing Summit. Others can purchase access to the full recordings (USD $175).